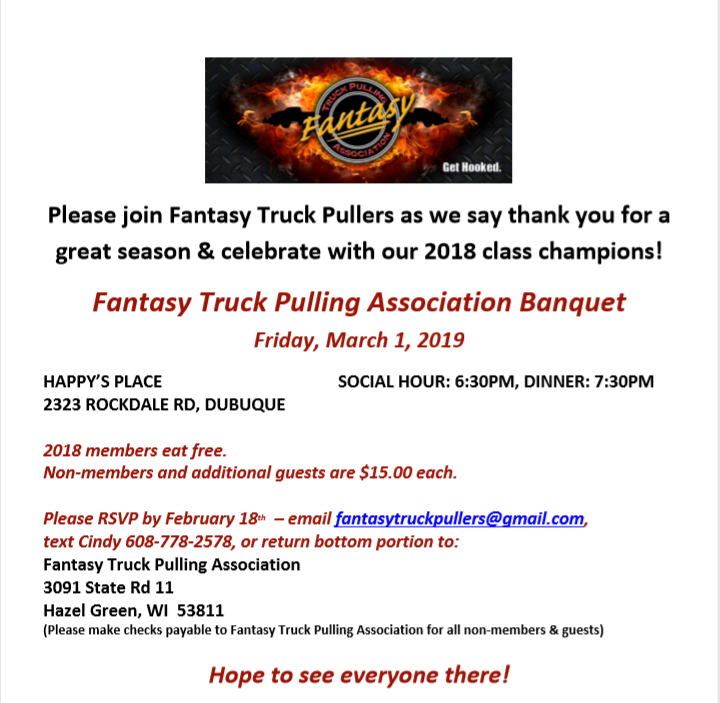 Fantasy Truck Pullers Association is your premier pulling organization located in the heart of the Midwest. We have events running from May through September, so check out our schedule to see if we're coming to an event near you, or visit our Membership page if you would like to join in on the fun! From all of us behind the scenes of the Fantasy Truck Pulling Association, we'd like to take a minute to say thank you to everyone that helped make 2018 a succesful season! To our pullers, our officials, our sponsors, the fairs and events we work with, and our fans - we couldn't spend our summer playing in the dirt without you! Thank you! We can't wait to see you on the track in 2019! New this year is a Big Block Altered Street class. Rules can be found here. Aditionally, rule changes for the Small Block Street Gas 4x4 are available here. Membership and Announcer Sheets for 2019 are available under Contact and Registration.